Last weekend, I was flipping through The America’s Test Kitchen Quick Family Cookbook, when I spotted a recipe for easy BLT Pasta. Soon, our garden will be overflowing with tomatoes and this would be a perfect dinner idea to use up all those yummy cherry tomatoes. They seem to grow better than anything else! The recipe is so simple and easy, with great flavors. I just knew it would be a winner, and it is. 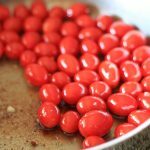 I adapted the recipe a bit to use what we had on hand, including these delicious little grape tomatoes. The tomatoes are really the star of this dish. I can’t believe how delicious they are just lightly sautéed. 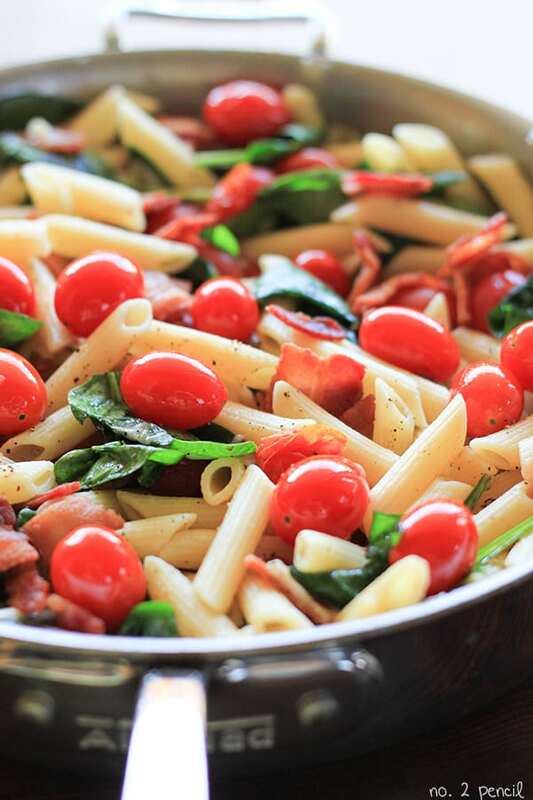 This easy BLT Pasta is a must make, especially on a busy weeknight. 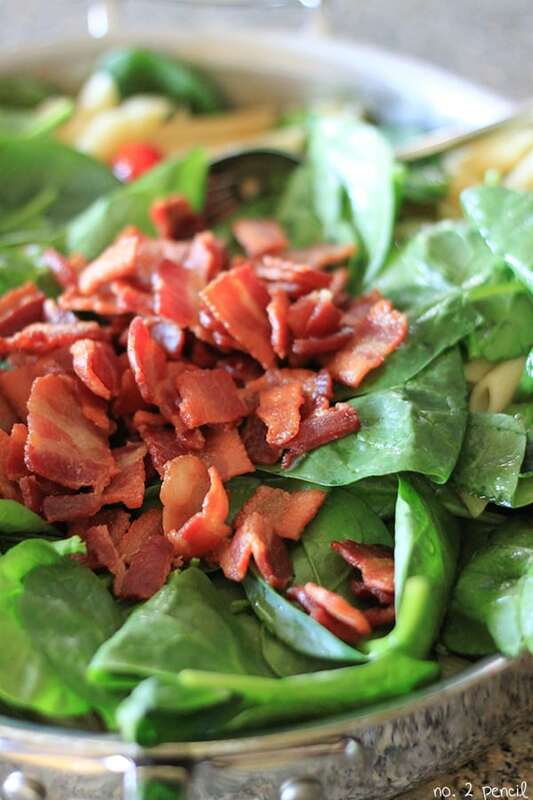 Crispy flavorful bacon, tender baby spinach, and juicy little tomatoes that pop deliciously in your mouth. The America’s Test Kitchen Quick Family Cookbook is one of my favorite cookbooks for easy and simple meal ideas. It has appetizers, breakfasts, dinners, desserts and even a kid-friendly section. America’s Test Kitchen tests all of their recipes in their real live kitchen, so you know that these recipes are going to work! You can pick one up on Amazon –The America’s Test Kitchen Quick Family Cookbook , or for a few dollars less at Wal-Mart – The America’s Test Kitchen Quick Family Cookbook . You won’t be disappointed! These grape tomatoes sautéed in garlic, olive oil and a little bacon fat are the best thing you will ever taste. Add in the pasta and 1/2 cup to 1 cup of hot pasta water. 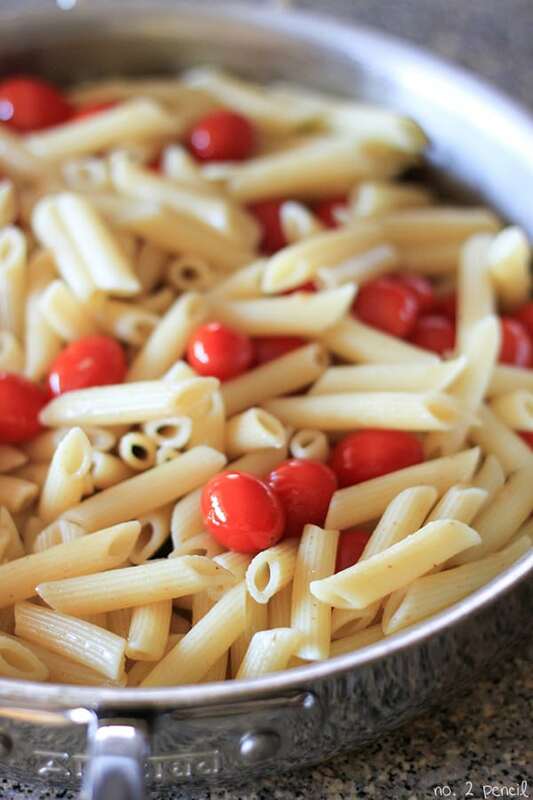 Make sure you salt the pasta water while cooking to add to the flavor. This pasta water combined with the olive oil, bacon fat and parmesan cheese will create the “sauce” for the pasta. Add the baby spinach and pasta water. Initially, I was going to add the bacon at the same time per the original instructions, but thought better of it after I took this picture. Save the bacon until the end of the recipe so it stays crispy! Cook diced bacon until crispy. Remove bacon from pan with a slotted spoon and let drain on a paper towel lined plate. While bacon is cooking, prepare penne pasta as directed in a separate pot. Reserve 1 cup of pasta water to create sauce with. Leave about two tablespoons of bacon fat in pan. 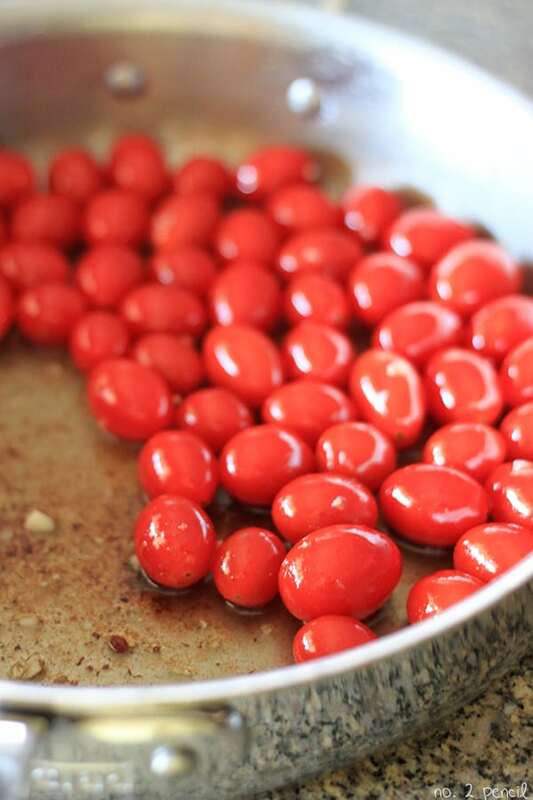 Add in olive oil and use to sauté tomatoes and garlic for about two minutes, just until slightly softened. Once pasta is drained, return to pot and add in tomatoes, garlic, 1/2 cup of hot pasta water and baby spinach. Add remaining pasta water, if needed. Stir until baby spinach starts to wilt, then stir in Parmesan cheese and sprinkle with bacon. Melissa, Your website is right on”‘ , love browsing recipies, the suggstions you give. I,ve been cooking for 3 people, then John, our son, went in the Navy. 4 years, came home and gave us a grandson. Noah, is so smart and going to be 6 yrs old next month. Baking I love , and decorating. Looking forward to browsing your wonderful site.